I recently got to take part in a Buzz Campaign and tried out Glade's Lavender and Juniper Berry. It is freaking awesome! I love the way it makes my bedroom smell! 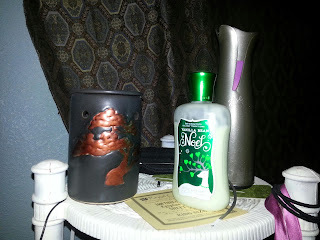 Pictured above is my nightstand, with my most 'needed' products! LOL. You'll notice there is a Wax Candle burner thingy, I no longer use it. LOL. 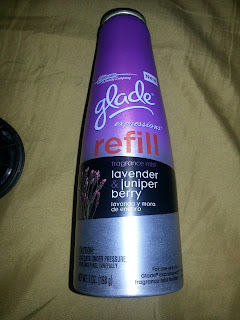 I just spray the bedroom with my Glade press and spray every now and then and my room smells amazing! Anyway, as you probably guessed, I am loving it and thought I'd share! Normally it's not something I would have tried but I am SO glad that I did! I challenge you: check it out!! !